Have you ever watched something so intriguing that you forgot about the time? Have you been in a room full of people where everyone shared the same point of interest? and you all forgot the time? Well, yes on all of those for me! 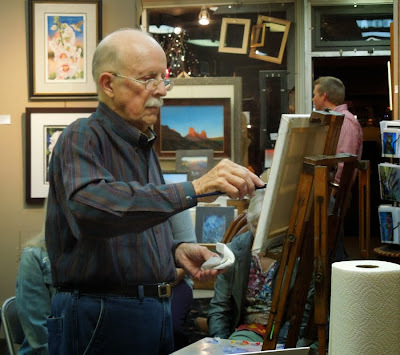 You could have heard a pin drop during Robert Knudson's painting demonstration at The Frame and I during Prescott's last art walk. Wow! As one person said - "it's quieter than the library!" Robert had prepared an oil sketch as the reference for his painting. 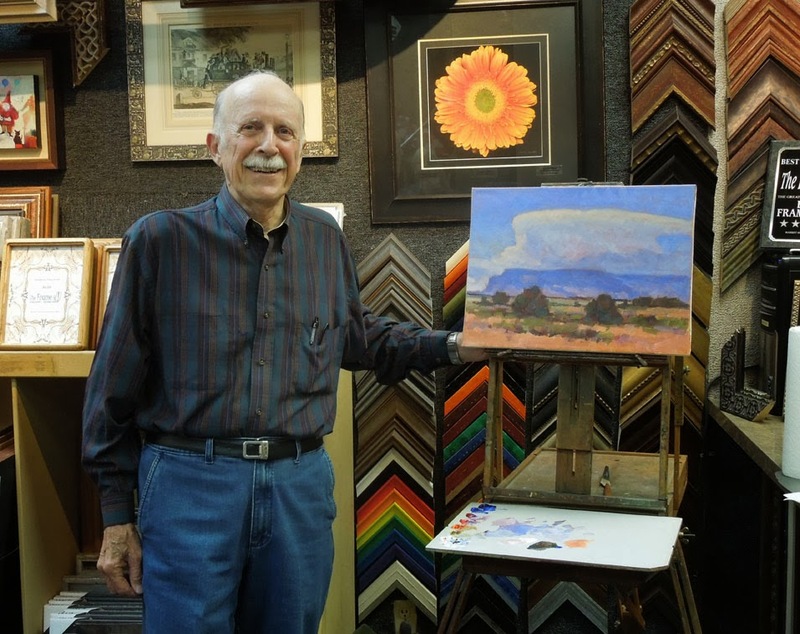 Robert and his easel have been all over the world for more than sixty years. 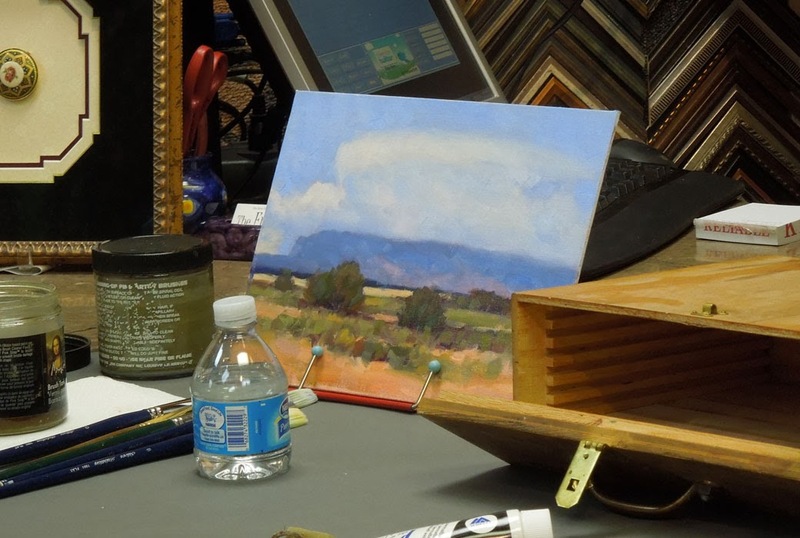 He has mastered pastel, watercolors, acrylic, and oil painting and is quick to share his experience. Watching him paint in oils was just as fascinating as watching him do a pastel painting. Check out my blog post, "In the hands of a master...", for details about his pastel painting demonstration that I saw. Wow! At the end of the demonstration, voila! A beautiful painting! Are you inspired? I am! That's one of Robert Knudson's goals - to inspire. He also teaches painting and will begin a new class soon. If you are in the Prescott, AZ, area check with The Art Store for details. Don't paint in oils? Well, take this inspiring nudge and go explore another class in something that calls to the creative artist in you! How wonderful that you were able to learn from this inspiring artist! I like what he says about painting not just what you see, but what you are feeling. It was wonderful! His approach to painting is like his approach to life. Wow! Amazing! It's wonderful you were able to witness his talent in action! I agree - wow and amazing! It was a wonderful experience! I remember meeting him when he was teaching down here at the Kachina Art School (I think that's what it was called!) - I love the way he captures the light in his landscapes. Wow - how fun! I didn't know he taught down there, but I'm not surprised. Lola passed away about a year ago, and he is just now getting back into to demonstrations and workshops. I agree - his ability to capture the light is incredible. Several people have mistaken his pastels for oils - amazing artist! He is also a deeply committed Christian. I think that shows in his artwork, too - a joy for the Lord's creation. Amazing! My kids were always mesmerized watching Bob Ross on public TV -- painting his happy little trees. So was my daughter. It made sleepovers with her cartoon loving friends very funny. She would try to get them to watch the painting shows instead of the cartoons because she liked the painting shows better. Very humorous results sometimes! haha - So very true! Beautiful work! How fun to see him creative this in person! Beautiful... very talented artist! Glad you enjoyed watching him paint!